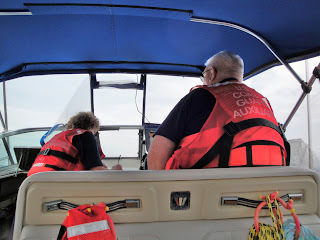 A U.S. Coast Guard Auxiliary patrol boat was waiting out a storm in the canal at Sylvan Beach Sunday afternoon (June 30) when Oneida County Sheriff's Marine Unit contacted the crew for help in searching for an overturned sail boat in the North Bay area and possibly a pontoon boat in distress. Three 9-1-1 callers had reported seeing what appeared to be boats in trouble. "We contacted Coast Guard Station Oswego…to let them know we were going out to assist," noted Flotilla 26 Coxswain Tom Paatz of Dolgeville, who had been patrolling Oneida Lake before the storm hit with crew members Melaine Paatz of Dolgeville, Ralph Moore of Sauquoit and Matt Jennings of Oneida. It was 3:10 when the storm it. At 3:25 they got the call for help. As they got underway again, the heavy rain slowed to a drizzle and the winds were on the wane, he said. Tom Paatz at helm; Melaine jots down search coordinates. "When we got out there, the Sheriff's Marine One was coming east, about a half mile off shore. We stayed a mile off shore, heading west." The Coast Guard gave Paatz coordinates to run a 2.6-mile-long parallel search pattern from near Buoy 107 to North Bay. Sylvan Beach and another volunteer fire rescue boat joined the search, along with Onondaga County Sheriff's helicopter. Once the copter flew over the area, spotting nothing, the sheriff and fire rescue boats decided to pull out of the search. Coast Guard rescue copter joined search. Coast Guard Sector Buffalo had the Auxiliary crew continue its search, and flew in a Coast Guard rescue helicopter from Sector Detroit. The helo flew a search pattern both north and south of the Auxiliary patrol boat search grid. After finding no overturned boats or debris, the search ended about 8:30 near Godfrey Point, and the Auxiliary crew was back at the Sylvan Beach base by 9:30. 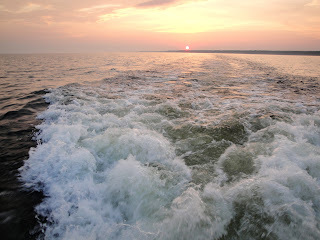 Search drew to a close as sun set on Oneida Lake. 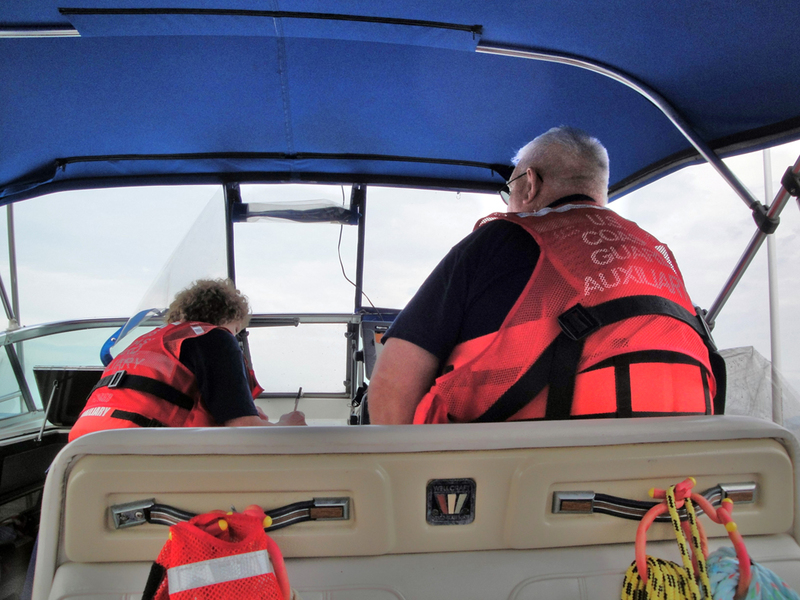 Since there were no follow-up calls about missing boaters, Paatz surmises that when the storm hit, a large sail boat he had seen out on the lake most likely dropped its sail, and when people on shore didn't see the sail anymore, they may have thought the boat capsized. 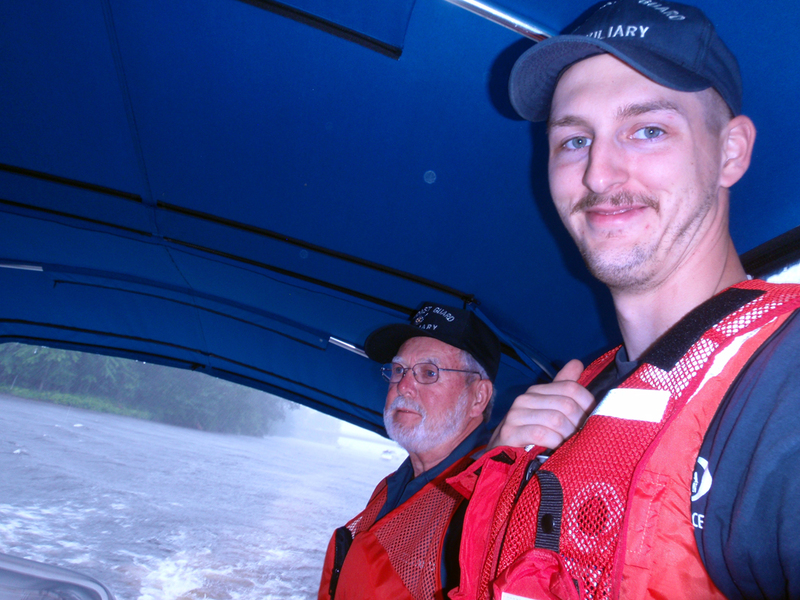 While doing the search grid, the crew came upon a lost boater who needed directions to Sylvan Beach.